At only 29 years old, John Crestani has accomplished amazing things. He went off to college in 2006, and in 2009, at only 21, traveled to Thailand to “find” himself. During his travels he read many spiritual works, like the Alchemist, that would later influence his life. But a business book, written by Tim Ferriss, was the one that factored in the most: The 4-Hour Workweek. It was the book that was to help him transform himself into becoming a motivated and successful internet entrepreneur. John spent several years with some trials and errors while building his business, but finally managed to hit on what worked. He has built a multi-million dollar business, got married and now travels the world. In 2016, he had his first child. He went from deep in debt, to having a successful, cashflow-positive business, that supports his life. As of late he’s gone on to build an empire in education, and is teaching a handful of aspiring entrepreneurs how they, too, can transition to the new entrepreneurial economy, and be the boss of themselves. Currently Crestani is preparing for the release of his new platform; a dramatic new business model focused on helping others gain control of their time. John hopes to share his experience and wants others to become part of a community of people who share similar aspirations. “Now is the only time to start living life on your own terms,” exclaims Crestani, adding “I hope to help people in any way I can.” He has been featured on Forbes, Business Insider, Inc., Medium, Home Business, CBS News as well as on radio stations such as KGO 810AM (San Francisco), CFAX 1070 Radio, (Victoria, BC), Fox News Radio, 820 AM KGNW (Seattle), WSVA (Harrison, VA) and the Michael Blum Show to name just a few. 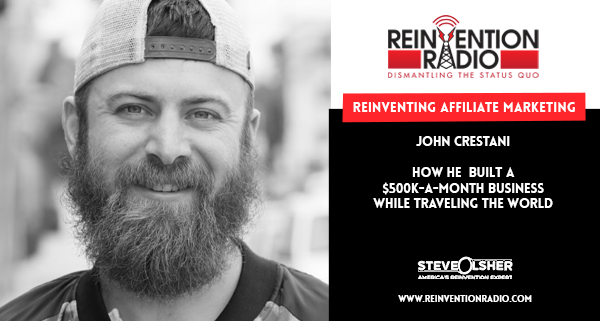 TUNE IN to this episode as John chats with Steve, Mary, and Richard about how he built a $500k-a-month business while traveling the world. Reinventing Blame – In this episode, Loren Michaels Harris chats with Steve, Mary, and Richard about how to stop wearing the “Scarlet Letters of Shame” and use them as ladder rungs to climb to the stars… and beyond.